Hi Janet and Janet’s husband! Lick your chops, that’s a good one, like the saying “When in Rome….”. 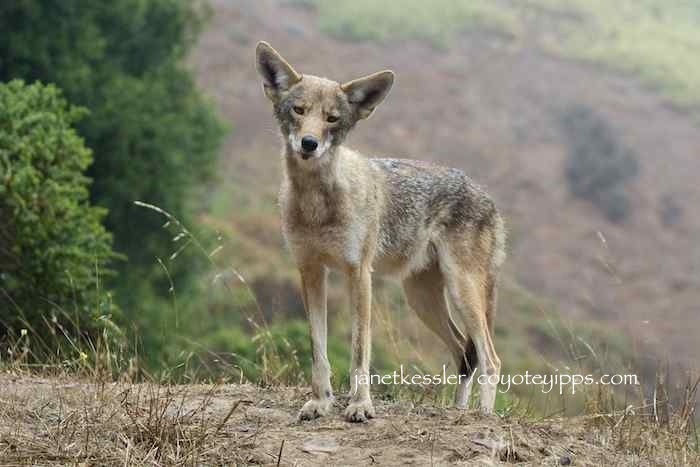 I thought I would offer some of my thoughts and speculations on some other possible signals we can give to coyotes before resorting to an approach. Note that I’m not experienced with human habituated park coyotes and so I am not sure how much my experience with field coyotes can be generalized. My coyotes were not habituated to people because they lived in areas where people didn’t routinely go. Also, I always had a dog with me when visiting my coyotes’ areas. So what I’m writing is applicable to people with dogs with them around coyotes. So here goes. The first thing, as Janet wrote, is eye contact. Is the coyote looking at you or your dog? Is the dog in front of you, by your side, or behind you? Put the dog behind to your side. Who is protecting whom? What is your dog’s posture? Is it acting like it’s the boss? I would want to be sure that the coyote was by body language told that it had to deal with me, not with the dog. However, from the coyote’s point of view, they observe our dogs leading us around, to one degree or another pulling us around. Coyotes may by such observations be disposed to disregard us as weak and dependent. So if out of the gate we humans immediately engage in displays of unfocused aggression like arm flailing and yelling, then an adult coyote may view us as unlearned in coyote language just like a puppy is unlearned in language. So yes eye contact. But command your dog first. Get your dog seated and looking dependent on you. Then stare at the coyote intensely. Be still and stare to signal you’ve noticed and that you don’t like being stared at and that you don’t like having your dog stared at. The coyote may just then decide to go away. If you at that point have the coyote’s attention then consider moving on. It depends on the situation. Pick your battles, as the saying goes. The coyote does and it may have a respectable, understandable reason for showing itself. It may not. So the next step is to ask the coyote how much being there matters to her. One thing I noticed that coyotes will often do when they do decide to move from the stare down phase to the approach phase: they stretch and they yawn. Like Janet’s husband observed, they “lick their chops.” Certainly not always. So one thing that might encourage a coyote to reconsider its willingness to stay in your sight is for us to stretch and to give a big yawn. At that point, that is, after a stretch and a yawn, I noticed that a coyote would soon next move to an approach. So I began to take coyote stretches and yawns as their saying: “I’ve had enough of staring at you, I’ve had enough of you being here. So I’m coming toward you soon. I am, that is, if I have to. I am if you don’t leave.” With a stretch and a yawn I came to believe that a coyote was signaling that its ‘thought to approach’ was congealing. With a stretch and a yawn or some other gesture of commitment to your human space, a coyote might decide it doesn’t want to know any more about you at all. In my experience with coyotes who had a reason to insist I leave (puppies), things moved slowly before they moved quickly. They had, as I remember it, a reason for each movement, and movement began small. They did a lot to signal that they were going to leave their space and come toward me before actually coming forward toward me. They put much energy into psyching me out before ever coming forward. Staring, licking one’s chops, yawning and stretching may be the signals that a coyote is looking for when trying to assess your intention and how much you really mean it when you do decide to move forward toward it. Yes to all that. Tossing, lobbing, it doesn’t take much force behind the throw, underhand, just enough to get it there is what I would say works. Like you’re pitching in T-ball. As to how far to move forward, not much in my experience. The coyote’s next move should be to move back. How far? How far should tell you how serious it is about staying. If it trots away you did good. If it starts and moves back a few feet and all its energy goes into its stance and its fur rises to make itself look bigger: you should leave. It’s scared and doesn’t want to be there and there’s a good chance it has to be there, has to be there because there’s something around it feels it has to protect from your dog. 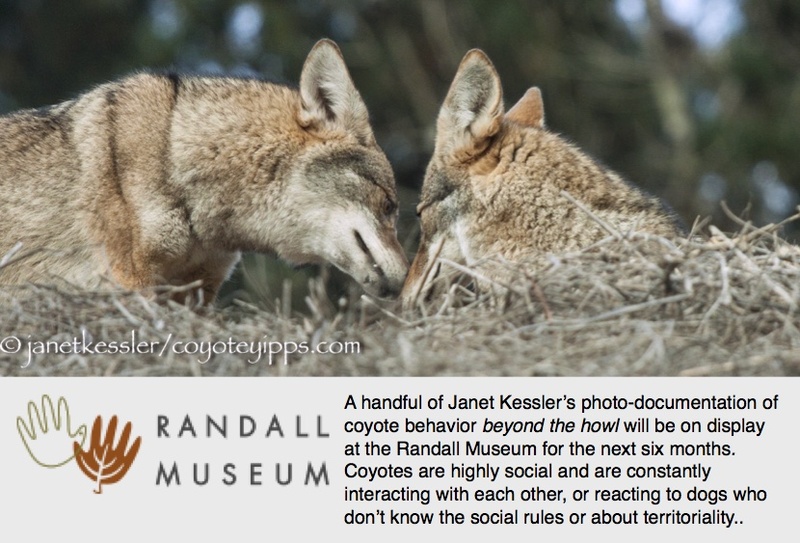 And as I mentioned, my experience was with coyotes who were not habituated to seeing people constantly in their space.